don't have to be Julia Child nor be intimidated in preparing the main dish in this Fall feast. You may even want to make this turkey for a Christmas eve dinner during the holidays as well since it's only a month away from Thanksgiving. 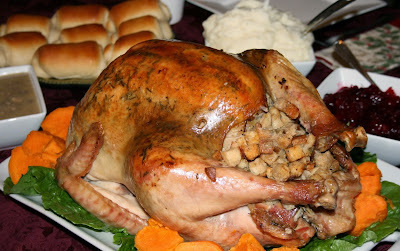 Not only do we get to learn how to make the turkey, but we even get to see how to make the stuffing and gravy as well. If you don't have time to do the stuffing from scratch, you can always just use Stove Top Stuffing. Nothing beats stuffing slathered and drowning in gravy. I chose the Old Fashioned Stuffed Turkey & Gravy as opposed to other turkey recipes (ie a frying a turkey) because it most resembles the turkey I grew up eating during Thanksgiving. This turkey definitely gives me a sense of nostalgia with memories of Thanksgivings past. Now I've only made this using an 14 pound turkey just like what is shown on America's Test Kitchen. I know that every turkey is different, but when you have the responsibility of making the turkey for Thanksgiving, I'd rather not leave anything up to chance. I figure using a 14 pound turkey would help minimize the odds of messing up this gobbler and, thus, having a disaster of a Thanksgiving. If you need a larger turkey or a smaller bird for your gathering, then by all means go for it, but just make sure you adjust the thaw and cooking times accordingly. Speaking of thawing your bird, please allow enough time (can be up to a few days) to thaw your turkey. I just cannot stress that enough. When it comes to preparing the turkey for Thanksgiving, thawing the turkey is often an overlooked step in the whole process. I've heard horror stories in which people thought they had given enough time to thaw the turkey, but ended up with a cooked turkey on the surface with a raw and/or frozen center. I never thought of roasting the turkey on its breast in the oven. Although I've seen it done before, I just never put it to practice until now. 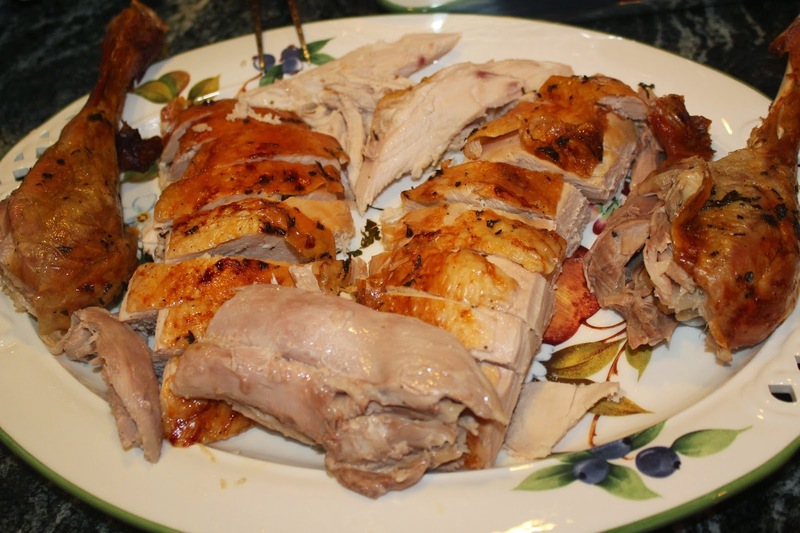 It does make sense though to do so since the breast (the white meat) easily dries out easily. And if you're a dark meat person like I am, you definitely don't want the white meat to be so dry that it would have the texture of sandpaper as your chewing. I do like how in America's Test Kitchen they use salt pork. The pork gives it a nice, "meaty" flavor. However, I skipped the salt pork simply because it's not something that was on our Thanksgiving turkey growing up. One of these days, I'll probably try it using bacon or pancetta (thick Italian bacon) instead because it's more readily available and I always seem to have a pack of it inside my refrigerator. I would think that bacon would work just as well because bacon is one of those magical ingredients that makes everything taste better. Add bacon to your omelets, burgers, sandwiches, and even chocolate and it'll just make it taste a whole lot better. I also used a different recipe for the gravy which has been in my family for a long time. A quick tip to get the skin of your turkey to be nice and crispy is to rub some butter in between the skin and flesh before roasting in the oven. As the temperature rises in the oven, the butter will melt, naturally basting the turkey with fat and allowing hot air to crisp the skin to a gorgeous golden brown. If this is the first time preparing a turkey, I highly suggest testing this recipe in a practice run prior to Thanksgiving. That way, you'll be better prepared for the big day and can anticipate possible trouble along the way. You definitely don't want something to go wrong with the main dish during Thanksgiving and a house full of hungry guests. Now that'd be very embarrassing! And remember, you'll be sure to have plenty of good leftovers for Black Friday shopping (only if you haven't overdosed on tryptophan) and even the next few days, so you can make turkey sandwiches, turkey pot pies (chicken pot pie but using turkey instead), or turkey and dumplings (instead of chicken and dumplings). If you plan to start your Christmas shopping bright and early the next day, these leftovers could easily sustain you for the Black Friday deals in your area. You definitely need the energy to fight the Black Friday crowds to find the best deal in town. I didn't use salt pork, but I'm open to the idea of using bacon or pancetta instead. Definitely roast the turkey breast side down if you want tender and moist white meat. This sounds unorthodox, but it definitely works allowing the white meat to soak up the juices. Rub some butter in between the skin and flesh of the turkey to get a crispy skin. 1. For the turkey: use your fingers or the handle of a wooden spoon to separate the turkey skin from the meat on the breast, thighs, legs, and back; avoid breaking the skin. Rub 1 tbsp of salt evenly inside the cavity of the turkey, 1.5 tsp salt under the skin of each breast half, and 1.5 tsp salt under the skin of each leg. Wrap the turkey tightly with plastic wrap and refrigerate for 24 - 48 hrs. 2. For the stuffing: adjust oven rack to the lowest position and heat oven to 250 degrees. Spread the bread cubes in a single layer on a rimmed baking sheet; bake until the edges have dried but the centers are slightly moist (the cubes should yield to pressure), about 45 mins, stirring several times during baking. Transfer to a large bowl and increase the oven temperature to 325 degrees. 3. While the bread dries, heat the butter in a 12 in. skillet over medium/high heat; when the foaming subsides, add the celery, onion, 1 tsp pepper, and 2 tsp salt; cook, stirring occasionally, until the vegetables begin to soften and brown slightly, 7 - 10 mins. Stir in the herbs; cook until fragrant, about 1 min. Add the vegetables to the bowl with the dried bread; add 1 cup of the broth and toss until evenly moistened. 4. To roast the turkey: combine the baking powder and remaining 2 tsp salt in a small bowl. Remove the turkey from the refrigerator and unwrap. Thoroughly dry the turkey inside and out with paper towels. Using a skewer, poke 15 - 20 holes in the fat deposits on top of the breast halves and thighs, 4 - 5 holes in each deposit. Sprinkle the surface of the turkey with the salt/baking powder mixture and rub in the mixture with your hands, coating the skin evenly. Tuck the wings underneath the turkey. Line the turkey cavity with the cheesecloth, pack with 4-5 cups stuffing, and tie the ends of the cheesecloth together. Cover the remaining stuffing with plastic wrap and refrigerate. Using twine, loosely tie the turkey legs together. Place the turkey breast side down in a V-rack set in a roasting pan and drape the salt pork slices over the back [I didn't use salt pork]. 5. Roast the turkey breast side down until the thickest part of the breast registers 130 degrees on an instant read thermometer, 2 - 2.5 hrs. Remove the roasting pan from the oven and increase the oven temperature to 450 degrees. Transfer the turkey in the V-rack to a rimmed baking sheet. Remove and discard the salt pork. Using clean potholders or kitchen towels, rotate the turkey breast side up. Cut the twine binding the legs and remove the stuffing bag; empty into the reserved stuffing in the bowl. Pour the drippings from the roasting pan into a fat separator and rsever for gravy, if making. 6. Once the oven has come to temperature, return the turkey in the V-rack to the roasting pan and roast until the skin is crisp and golden brown, the thickest part of the breast registers 160 degrees, and the thickest part of the thigh registers 175 degrees, about 45 mins, rotating the pan halfway through. Transfers the turkey to a carving board and let rest, uncovered, for 30 mins. 7. While the turkey rests, reduce the oven temperature to 400 degrees. Whisk the eggs and remaining half cup broth together ina small bowl. Pour the egg mixture over the stuffing and toss to combine, breaking up any large chunks; spread in a buttered 13 by 9-inch baking dish. Bake until the stuffing registers 165 degrees and the top is golden brown, about 15 mins. Carve the turkey and serve with stuffing.